If you invited me to a cocktail party, I’d bring this. slathered in pure maple syrup with a crisp, candied crust. It takes only 5 minutes to prepare and 30 minutes in the oven. I even foil the baking sheet a million times for easy clean up. Honestly, the hardest part of this recipe is getting the bacon out of the bag. 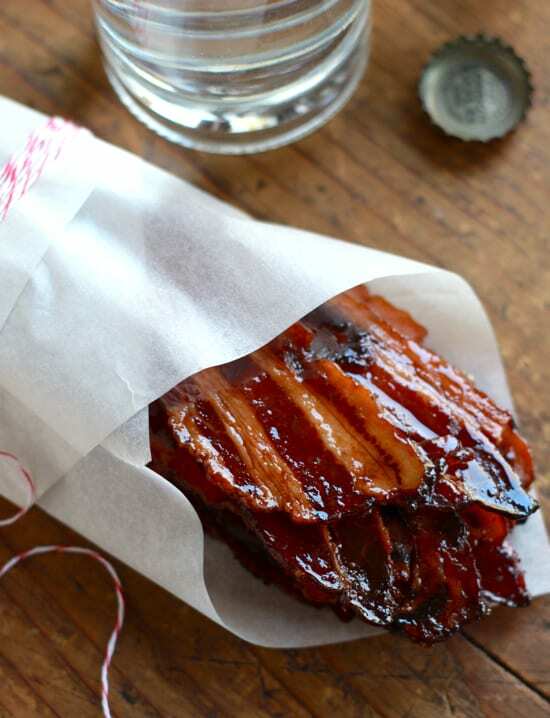 Maple-candied bacon makes a great hors d’oeuvre (is that how you spell it?) to serve with cocktails. Any leftover bits can be thrown into salads and of course, there’s always the BLT. Just a little warning my friends… these candied beauties are hard to resist! In a large bowl, add the maple syrup, brown sugar, Dijon mustard, Kosher salt, and cayenne pepper. Mix well. Add the bacon to the bowl and toss gently with your hands. Make sure that all of the slices are evenly coated* See note below. Place the bacon in a single layer onto the wire rack. Bake in the center of the oven for about 20 minutes. The bacon will be a bit brown, but will most likely need to bake for another 10-15 minutes. It should look slightly dark (not burnt) and crispy. If you take it out too soon, the texture will be chewy. Be patient! Once cool enough to handle, you can break the bacon into chards (you'll have about 32 pieces). Alternatively, you can leave them whole. *Note: When using a full pound, the bacon mixture will seem a bit dry when tossing with the glaze ingredients. This is how it's supposed to be. Additional sauce is optional, but not necessary. Hi Merryl! If you like salty, sweet with a crispy crust then I’d say go for it! Note: use 1/4 c. of brown sugar (and not 2 tbsp.) I just caught a typo and updated the recipe! Sorry about that :) Let me know how they turn out! Not a problem Merryl! I’m glad I caught it. is the bacon sticky? mess to touch? When preparing the recipe, the bacon is sticky when mixed together with the glaze ingredients. It is not sticky after it’s baked as long as it has cooled down properly. Hi I have just made these… They are delish but what is the best way to store them ..?? Only using them tomorrow ..!!! What a girt…You amaze me with your creative cooking art! Thanks Barbara! Everything’s better with bacon, no? Ha ha…thanks Barbara! It’s a deal- I’ll bring the candied bacon if you make those cute mini hand pies :) Hope you had a great New Year! This recipe was amazing! I made this today and it was fabulous, although I only did 5 pieces of bacon. Did you have enough sauce for a whole pound? Because I ran out just after those few! Maybe I put too much on it. Anyway, here’s my link – I linked back to you and did not post your recipe. Hi Sara! Yes, there is enough sauce for the whole pound. It’s not like a marinade where you’d have lots of extra sauce, it’s just enough so that that bacon is lightly covered. If you’d like to double the amount, by all means go for it! Just watch it in the oven as it cooks because the extra sugar in the sauce might cause it to burn. Hi! I am Paleo too and I’ve found coconut sugar is far and away the best substitute. You substitute it 1:1 and it caramelizes beautifully. It has a richer caramel taste than brown sugar in the first place, but that is just a bonus here. Good luck! This sounds amazing!! I wanted to make this for my boyfriend for valentines day and was curious about something. I have seen something about forming the bacon into a heart shape and baking it in the oven. Is it possible to do this and have the maple glaze turn out the same or do you think it would mess with the end product too much. Thanks! Since I haven’t made these myself, I would feel awful giving out any misleading advice… But, to be honest with you I don’t think that the glaze would mess with the end product. You just have to keep an eye on your hearts while they bake, as the tips and rounded edges tend to brown faster than the rest (to avoid this, just keep rotating your pan). If you happen to have the Pinterest recipe I could take a look and give you more specifics. Like I said, I can’t speak from experience but I hope I answered your question! Good luck and let me know how they turn out! Hi Candice! What a wonderful wedding gift idea. From memory- I usually make these in the morning, and leave them out on the counter for a couple of hours. I am not sure about the exact amount of time, because everyone eats them so fast! FYI- I leave the bacon on a parchment lined plate (so that they do not stick), uncovered. How would I go about storing this? Air tight container? Would you refrigerate it? It’s funny because I’ve never had to store these- everyone eats them so fast! I just wanted to let you know that I made a batch of this bacon on Friday, and have been storing it in an air-tight container in the fridge. It’s Sunday now, and they’re still good! Before serving, I would bring these to room temperature. Just note that when bacon gets cold, you’ll see some of the residual fat on the slices. However, this seems to dissipate when brought to room temperature. You could always blot it away with a napkin as well. Hard to resist? Nah… I can’t see that at all! ;-). These candied delights look incredible Emilie. I make something similar with brown sugar – it’s a well loved treat in this home for sure. (If I ever need to get my boys out of bed in the morning – bingo! :)). I really like how you’ve packaged the bacon in paper here (fun pub feeling) and the cocktail display as well – lovely! Am I to seperate the slices individually before tossing in ingredients, or leave the pound intact then baste? Hi there! You will need to separate the slices before tossing into the glaze.Do not leave the pound intact. 1.) Mix up the glaze in a large bowl. 2.) Add the entire pound of bacon (slices separated) and toss gently with your hands. When using a full pound, the bacon will soak up all of the liquid (it may seem a bit dry but this is what you want). Make sure that everything is well coated. 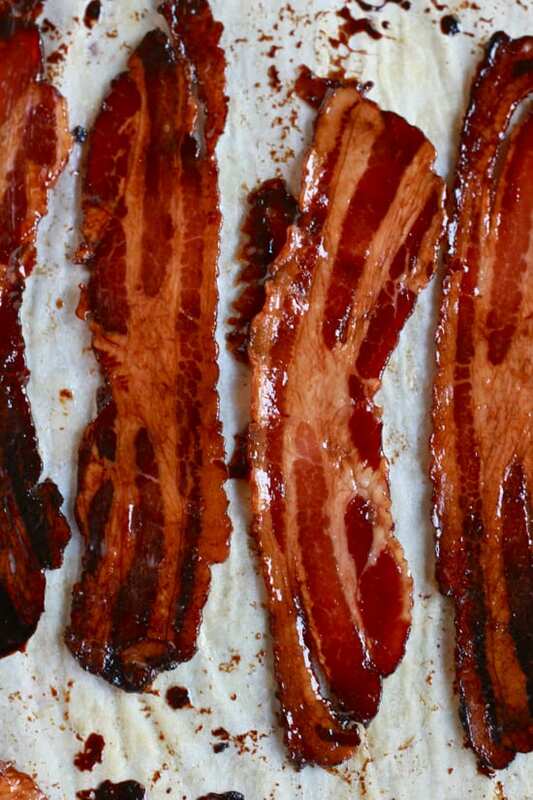 this.bacon.looks.ahhhmazing. 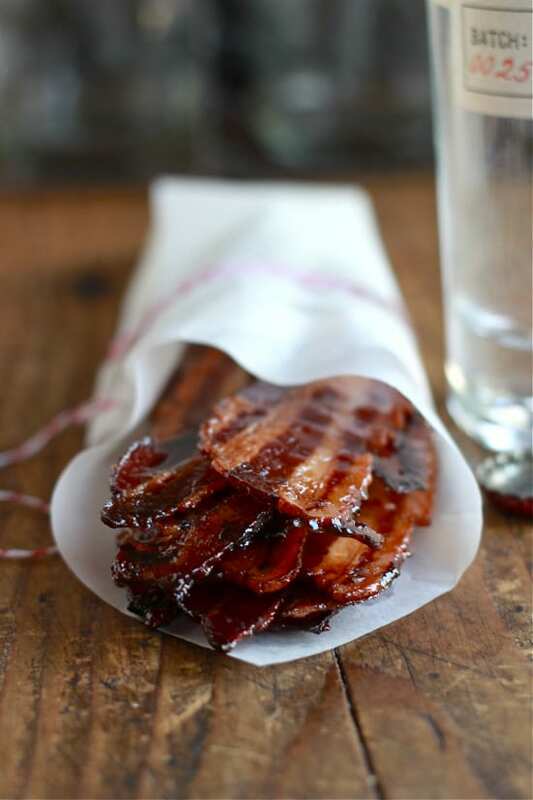 Seriously – my Sunday pancakes need this bacon! Thank you so much! They’ll be great with your Sunday pancakes :) Any leftovers can be used in tons of things (salads, sandwiches, soup toppings etc…) Enjoy the recipe & thanks for stopping by! This was a good recipe. My marinade seemed runny and I had plenty for the pound of bacon. Also, I found there was a thin line between crispy and burnt. I actually liked the bacon a little less cruncy and a little chewier. Thanks for sharing – I am trying again. The next time you make this, double check that your oven is the correct temp. using an oven thermometer. If it’s too hot, it will cause the bacon to burn! Also, try rotating you pan halfway through cooking time. This will help it to brown evenly (the tips tend to get a little dark no matter what). But if you like your bacon less crunchy anyway, just pull them out of the oven before they get too brown. That will be your best bet! These were amazing. No, the hard part is not removing the bacon from the package…it is not eating them all as soon as they are cool enough to handle!!! Thanks for this great recipe. Ha ha… I guess you’re right! I’ve been guilty of eating them burning hot too! They’re too hard to resist (and I have absolutely noooooo patience!) Thanks for making the recipe!!! PS- I’ve been freezing any leftover bits and adding them to salads with dried cranberries & goat cheese. Yum! loved this recipe! however when i made it, and lined the pan with foil, there was a crack in the foil and maple got under the foil and now it has stuck to the pan as the maple has hardened into the rock, any tips on how to remove the foil ? Place your pan into a 300 F oven. The heat will soften the maple syrup making it liquid again. Once loosened from the pan, remove from the oven and wipe away any syrup/grease/foil with a paper towel (you want to do this when the pan has cooled down slightly so that you do not burn yourself!) Clean thoroughly with soap and water and you should be all set! Can you use thick sliced bacon or should it be the thinner sliced? Can’t wait to make this. How can I not like it? It sounds amazing. I told my hubby if he got the bacon I would make it for him today. I will sure let you know how this turns out. Thanks for sharing it. This has been tried in my family… umm tried????? I should have said made and DEVOURED. I no sooner get it out of oven and i got a waiting line. This is awesome and must say that for a different house warming gift, shower take along or a general meal enhancement.. we sometimes have it with pancakes. Thank you so much for posting this last year. I just wanted to say thank you! This recipe was a hit not only with my other half but I made it and took it to my culinary school, and my presentation (on bacon) was a hit! I love it so much I re-blogged the recipe…I can’t get enough of it! Thank you again! Best treat ever!!! Incredibly, deliciously addictive, thanks! We tried chocolate covered bacon for Father’s Day. The sweet/salty combination was perfect. I imagine this will be just as yummy. Thank you for sharing. It looks fantastic, but what sort of bacon are you using? Streaky? I use regular, good-quality bacon (streaky) from the grocery store. It’s nothing fancy! I love this recipe and gorgeous photos too, so glad I saw this on pinterest! I was wondering if turkey bacon would work because we do not eat pork. Am anxious to try this delicious looking recipe. Bravo! This recipe is bacon-tastic! We tried out the recipe for a potential Mother’s Day snack and I don’t think Mom’s gonna get any! We’ll need to revisit the grocery store in the morning! Hi there! Great question. I wouldn’t recommend chilling the bacon in the fridge overnight; the residual fat and candied crust will get too hard. When it comes back to room temperature, the texture will change and may not be as crisp. You don’t want to take that chance! Had breakfast for dinner tonight and made this along with soft scrambled eggs. Set the oven to 375 and baked for 25 minutes. Delicious!! If I do not have a wire rack, would it be ok to make these on a cookie sheet or in a baking pan of some sort? Yes, you can substitute honey for maple syrup. However, honey has a tendency to burn faster so keep your eye on the bacon as it bakes. It’s going to brown quickly. Lower the temperature if necessary. Have fun with the recipe! Enjoy! So excited to find a recipe for the candied bacon. I was recently at a restaurant that uses it in their Bloody Mary’s and was amazing. I’m a little confused however. I am having a 3oth birthday party (ahhh-tomorrow) and I was going to try and make this today because of time constraints. In your comment on 1-27-13 at 11:00 am you say you made some and stored it in the frig and it was fine then on 9-16-14 at 3:55 pm you said it wasn’t a good idea to chill it. I plan on making a few batches, one with a little more spice to it and some to be used in a potato bar. Happy Birthday! I’m so glad you sent over this comment as many of you have asked the same question (and no worries about the dates and times!) Here’s the thing- I’ve chilled the bacon before with success, however the residual fat and glaze does harden a bit. They will need to come to room temperature before serving. I’ve been hesitant to recommend this method for big parties and get togethers because you never now what can happen with large batches, hence the opposing comment. Does that make sense? Because of your time constrains here’s what I would do: go ahead and make them ahead of time but make sure that you store them in a container lined with parchment paper. Since you are making several batches, make sure to place a layer of parchment in-between the slices (if you are stacking) so that they do not stick. Yes, very helpful although I ran out of time yesterday and will be preparing them today for the party. Will keep the suggestions in mind for other times. Just hope the birthday boy stays away while it’s getting prepared. I have made these several times but I can never get mine to crisp up they are still bendy… What am I doing wrong grrrr? What is your suggestion if you don’t have pure maple syrup? Thinking of making this for my daughter’s baptism brunch. Could I cook them and take off the pan a few hours before serving, or is it best to wait until right before? Thanks! I made this this morning for my department at work. Sadly, I ran out of time and had to take the bacon out before it was nice and crisp–only parts were. Even so, it was gone almost immediately. I have never brought anything that was eaten up so quickly and with so much relish. I now plan on making some more to put in my roasted Brussels sprouts with pecans and a lemon-maple-Dijon glaze for Thanksgiving. Yes you can make it on a broiler pan but make sure it’s lined so the bacon doesn’t stick. You can also use thick cut bacon. I’m not sure exactly how much longer you’d have to cook it, but no too much longer. I would recommend just keeping your eye on it so it doesn’t brown too much or burn. And yes, the sugar is packed! Wow. I made this for a Mardi Gras party, and it was a HUGE hit. Thank you! Hello Marianne! That’s wonderful! Thanks for the feedback. They’re quite addicting, aren’t they? I made this recipe a few times. It is to die for. I get requests for it at work. I have made it with thin and thick applewood bacon. It’s all good. I also used a smoked brown sugar that I purchased on line from Sur La Table. The brand is Darkhorse if your are interested in trying. Thank you for such a yummy treat! I made this recipe today and it was delicious. However, mine didn’t get as stiff as I would have liked. 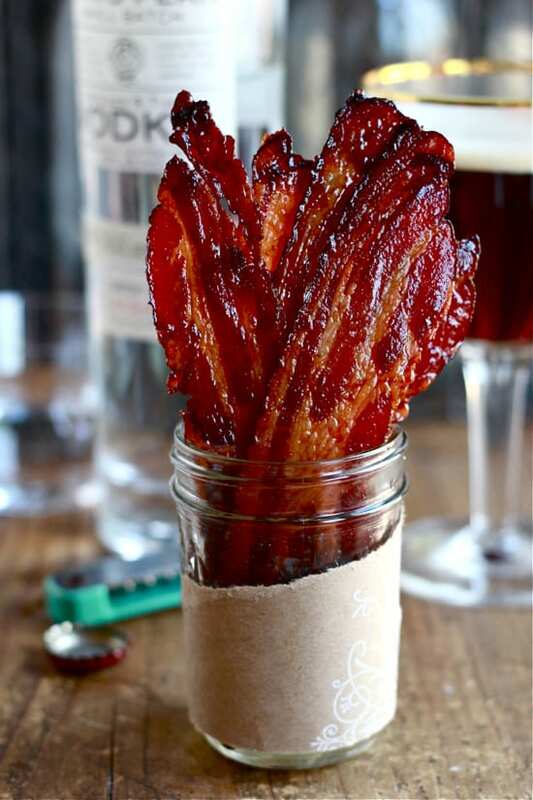 I had this at a restaurant before and it was served in a glass and the bacon was like a stick. It looks like from your picture yours is the same. Any suggestions? This recipe is amazing! The perfect balance of savory, spicy & sweet. I made a batch & even my kids loved it! I always end up adding 1 tspn Bourbon Vanilla extract & topping it off with red pepper flakes as garnish. But it’s awesome just as it is too! I’ve made this recipe 3 times in the past month now. It’s a hit! THIS is how you buy friendship and love, people. Thanks for keeping this recipe available, I want to use it as a garnish for Natalie Miglarini’s (@beautifulbooze on IG) Maple Negroni cocktail. She calls for a bacon garnish, which got me thinking about jazzing up the garnish with maple candied bacon instead. I’m gonna give both recipes a go over the Thanksgiving Holiday this year. This is an awesome addition to a Bloody Mary bar where people can make their Mary’s THEIR way. Speaking from experience….